We get ALL packages shipped ASAP, and UPS NextDay/2nd Day Airs get HIGHEST Priority. As you consider your timeframe please realize UPS AIRS (Next & 2nd Day) INCLUDE BUSINESS DAYS ONLY! Trying to order by phone during the season is very difficult, at best. You will get faster, safer and more accurate results by ordering online, we promise. Billed at Cost plus Handling Charge. Generally, if you order before 2:30 or so CST Tues-Fri, we ship that day. No kidding. On Mondays during the High Season (Oct-Christmas) we back up a bit on Mondays. You will get a Tracking Number emailed FROM UPS about 5pm CST the day your package ships. It may end up in your spam folder, so check there first if you don't see one. We Ship UPS Monday through Friday, and UPS Delivers Mon-Fri.
Saturday and Sunday do not count in UPS Next Day/2nd Day or most Ground Calculations of Shipping Time. Check the UPS Ground/SurePost time-in-transit map at bottom for the best idea of how long shipping takes. We ship "No Signature Req'd". If you want an adult signature for package release, there is an $11 surcharge. 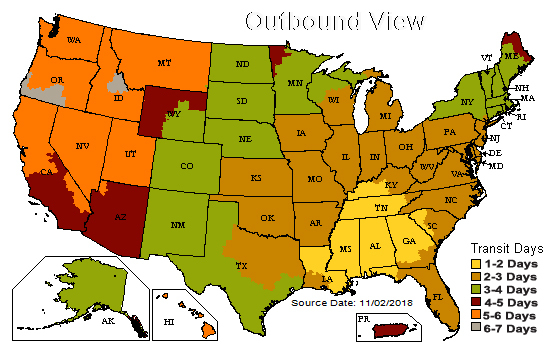 UPS Air and Ground Shipment times (see chart below) are based on business days in the U.S., and do not include Saturday or Sunday, or International Destinations. If you require INTERNATIONAL, ALASKA or HAWAII shipping, please see below. Guys, we love you but AK and HI orders with frequently high associated ship costs require that BigCamo.com give you a manual quote. TO Order: Proceed online normally -- The $45 figure you see at checkout for AK/HI IS NOT YOUR QUOTE! We'll email you once you've ordered with a correct and calculated figure you can approve. We will calculate the best value option based on your package size and your time constraints (if any). Our system has no way to do this automatically, so were are left with this manual work-around, which we will try to get to you ASAP via email after we have packed/weighed it. Again, the $45 at checkout IS NOT your final cost, just wait to hear from us. The 5 Steps to Successful International Ordering. You will NOT PAY when you order. We will calculate an exact shipping cost and send it to you for approval at a later time. If you appove, at that point we will ask for payment. Before you begin, put your Credit Card away. Leave it in your pocket. Once we have had a chance to receive, pack and weigh your order, and then email you a specific quote for your approval, you can give us payment information. You will get a "Thank You" screen with an order number. We will email you with a quote for shipping (and any other questions we have) at a later time after we have a chance to pack/weigh the items. In the meantime, please familiarize yourself with our International Policies below. MANY THANKS! We ship via UPS Global Expedited and include Brokerage in the shipping fee quote that we will email separately to you. This will NOT include VAT/Border Duties, which must be paid, by you, upon arrival. WE RECOMMEND AGAINST SMALL INTERNATIONAL ORDERS (ie 1 or 2 small items), AS THE ASSOCIATED FEES ARE ALWAYS TOO HIGH. Most packages are between $45 and $170, based on Weight/Brokerage (see hints below). The $250 fee for Shipping on the Cart is a maximum (and not necessarily your cost), since we have no idea of actual costs until we can calculate them manually, and we only charge the minimum necessary to get your package to you. We'll EMAIL YOU for cost approval (over $175 is very rare), and WAIT for you to email back indicating your approval and that you are "OK To Ship". If you've done this with us before, we can process it without waiting for your "OK". PLEASE NOTE: We ship exclusively through UPS Shipping. In past years, we utilized other systems and carriers with poor results. We believe UPS protects both you and us against non-delivery, late-delivery, damage, and uncertainty. We place a high value on timely, undamaged, trackable delivery, and have negotiated the best value available to all of us to obtain it. If you would like lower International shipping charges, please do not ask us to ship US Postal, or to modify our invoicing. The best alternative is for us to ship to a friend/relative of yours here in the States who can forward to you. SERIOUSLY - We cannot stress this enough. If you are unsure as to your exchange rate, government imposed duty, customs fees, VAT or other charges, please research these prior to ordering. We have provided some useful links below to assist. In our opinion, border charges are frequently excessive. If you are as upset as we are by taxation at the border, please take it up with your government, as they &@%* well deserve it! Here are two United Kingdom Information Links: UK Fee Disclosures and UK Fee Calculations. Brokerage fees should be included in our UPS Shipping Charge to you for the UK.